“Write Where It Hurts” was the thirteenth episode of the second season of Daria (episode number 213). It first aired on MTV on August 3, 1998. "Write Where It Hurts" was written by Glenn Eichler. At the Morgendorffer's, Helen tries to talk with Daria, but the latter only answers sarcastically about the book she's reading and her life. The situation is not helped by Jake's lack of success with his culinary experiment and Quinn loudly preparing for another date. The next day, in school, as Daria has read all books assigned to English class, O'Neill gives her a special assignment: to write a fictional story using real persons as characters. Daria finds difficulty with the work. At the Lane's, as Jane is painting and making suggestions, Daria writes and throws away two drafts, one inspired by the film The Graduate, and the other heavily influenced by Jane Austen. At the Morgendorffers', Helen tries to probe her depressed daughter, offering advice and encouragement when Daria tells her about the assignment and her inability to write. However, between Eric's constant calls and an inadvertent comparison to Quinn, Daria snaps and scolds her mother for the poor parenting. Fleeing to her room, she uses her anger to write another story, describing laid-back Jake and Helen relaxing and chastising Quinn for her superficial teenager life, encouraging her to be like Daria, with Quinn tearfully agreeing with them before running outside and being hit by a truck. Daria also throws this story out. The following day, Daria goes to see O'Neill, explains her lack of progress and frustration and requests not to write the story. The teacher encourages her instead, adding the requirement of using a game of cards in the story. Daria tries using this into the previous medieval story (this time starring Mack and Jodie), but ends up also throwing it away. A few years into the future, adults Daria and Quinn visit their parents. Grey-haired Helen and Jake have now retired, with Jake having had heart surgery. As to the daughters, Daria is married to a college professor called Marcello and writes opinion columns, still defending the same ideas she had in high school, and Quinn has married Jamie and is now the mother of four kids. As the four Morgendorffers talk, Jake reveals that the family has come out as he wished: Daria is now a known activist, demanding honesty and truth, and Quinn has transformed from a fashion-obsessed teenager to a responsible mother. So now he just wants to enjoy life and has asked her daughters over to play a nice game of cards with his family. After a brief discussion, they agree on Hearts. Daria anxiously shows her mother her story. Helen, after reading it, tears up and hugs her daughter. The book Daria is reading for school is On Moral Fiction by John Gardner. Daria sounds distinctly unimpressed with it (but could be just trying to get Helen to stop talking to her). Books with "moral dimensions" that O'Neill lists on the blackboard are: 1984 by George Orwell, Huckleberry Finn by Mark Twain, Madame Bovary by Gustave Flaubert, Frankenstein by Mary Shelley, The Dharma Bums by Jack Kerouac, and Breakfast of Champions by Kurt Vonnegut. Considering the subject matter and style of some of these stories/writers, this list is quite surprising for O'Neill. Daria's second story implies she's read Jane Austen. O'Neill's assignment does challenge Daria, making this the one episode where O'Neill's ideas work instead of comically failing. 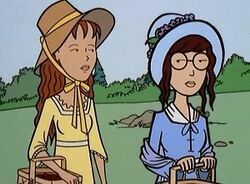 Daria tells Helen "nobody [at school] talked to me again this week": her phrasing and bored tone indicates that this level of ostracisation is status quo. The other episodes, however, repeatedly show people talking to Daria, because otherwise no plot can take place, and this seems to bother her more than when they don't. In "Psycho Therapy", Daria will explain that she tries to shut down conversations with her mother because she knows Helen will "hang on every word" and that makes her feel uncomfortable. We can assume from this that Daria's seen The Graduate and liked it. Daria chooses Jamie White as Quinn's future husband. No reason is given for this choice, though it may have just been random, as "Lucky Strike" shows that she cannot keep track of which J is which. Daria also has Jesse Moreno as Jane's "suitor", though he never went after Jane in the series. An early pairing in fanfics was Jesse/Jane, however. The first story with Quinn has her suffering emotionally (and then physically) because everyone wants her to be like Daria, a rather vicious revenge fantasy - Daria's final story reveals that she actually wishes she could get on with her sister, and that Quinn was a wildly different person so this could happen. Season 5 would later show Quinn and Daria getting on better without Quinn changing that much. "Marcello" keep turning up in post-canon fanfic as a boyfriend, husband, or ex-relationship of Daria's. A novelization of this episode was written by Martin J. Pollard. "The Other Story of D", a dark counterpoint to Daria's story by The Angst Guy. In the Dariarotica story "I trust you" by Wouter Jaegers Daria's transistion to the way she looked in her future vision is depicted.